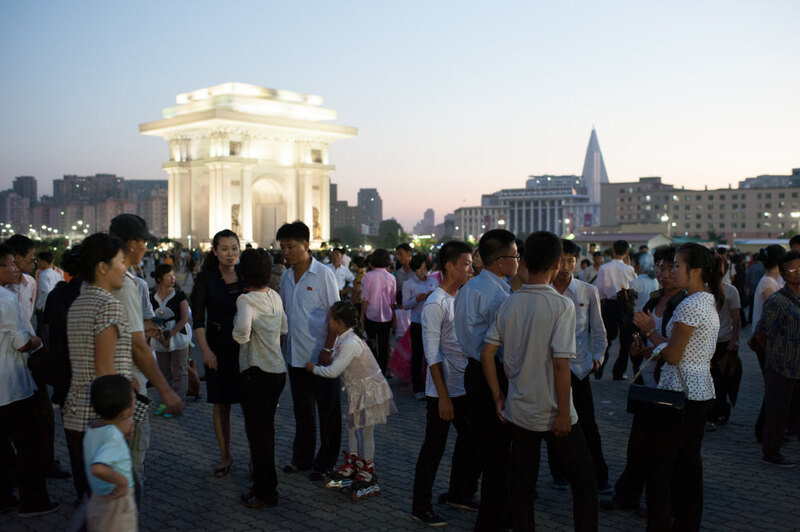 One of Pyongyang’s most iconic monuments, the Arch of Triumph is larger than its Parisian predecessor at 60 m (197 ft) high and 50 m (164 ft) wide. Built to commemorate Kim Il Sung’s role in the Korean resistance to Japanese colonialism from 1925 to 1945, it was opened on his 70th birthday in 1982. It is built from white granite and decorated with various reliefs, inscriptions, and carvings. You can observe the arch from the plaza in front of Kaeson Youth Park, but to get a good look at its details nothing beats walking right up to and even underneath it! 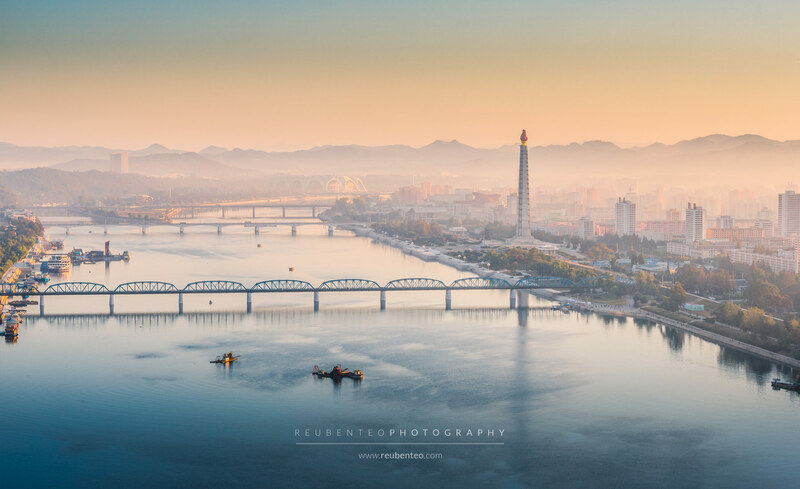 As of summer 2017 it is possible to take an elevator to enjoy the view of Pyongyang from the top. This requires an entry fee of 20 Chinese yuan per person. There’s also a souvenir shop inside. 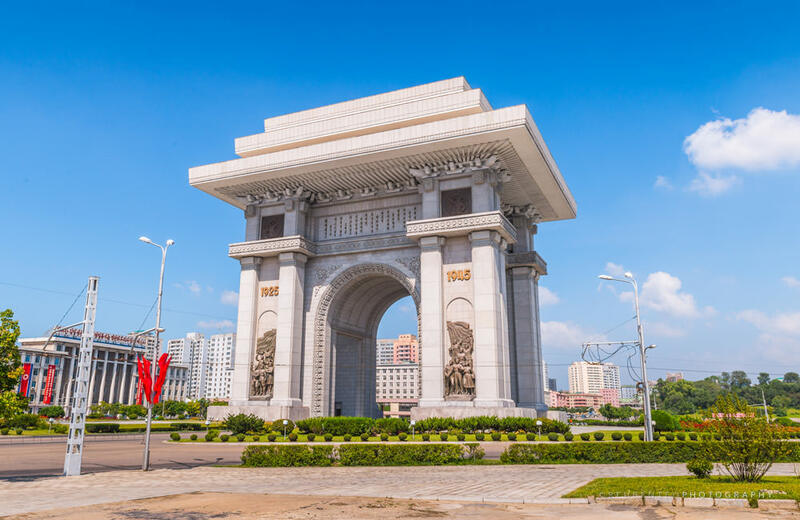 The Arch of Triumph was opened on Kim Il Sung’s 70th birthday on April the 15th, 1982, together with the Grand People’s Study House and the Tower of the Juche Idea. The years 1925 and 1945 are marked in bronze characters on the surface of the arch. 1925 is the year that Kim Il Sung, as a boy of 13, left his home in Pyongyang to fight for Korea’s independence from Japanese colonialism. This culminated in him walking all the way to Manchuria in what was later labelled the first “Arduous March”, an event which features prominently in North Korean official history. Today, schoolchildren go on excursions following the route of the march while educating themselves on their leader’s achievements. In Manchuria, Kim Il Sung settled and became involved in the Communist and anti-imperialist movements. He later became a guerrilla fighter, engaging with the Japanese army along the Sino-Korean border. 1945 marks the year Japan surrendered and Korea regained its independence. Kim Il Sung returned to Pyongyang this year and became North Korea’s leader. It was his first time home in 20 years. The plaza across the road from the arch in front of Kaeson Youth Park features a mural depicting Kim Il Sung’s first public speech upon returning after liberation. The Arch is made up of 25,500 blocks of granite, each representing a day in Kim Il Sung’s life up until the day it was opened on his 70th birthday (365×70=25,500). The Song of General Kim Il Sung, which is considered as important as the national anthem, and which is the first that children learn to sing in kindergarten, is inscribed into the top of the monument. Bronze reliefs decorate the bottom. They feature Korean people waving banners celebrating Kim Il Sung and the country’s liberation from Japanese colonisation. At the top, under the tri-layered roof, you can see a nod to traditional East Asian architecture. Mock versions of the wooden brackets (두공; 斗拱) that support the underside of traditional East Asian roof eaves are carved out of stone.